Although not widely reported, average weekly worship attendance in The United Methodist Church (U.S.) dropped by a record 3.3 percent from 2015 to 2016. On any given Sunday in 2016 there were 90,500 fewer people worshipping in the denomination’s local churches than in 2015. This decline comes on the heels of two previous record losses of 2.9 percent in 2015 and 2.6 percent in 2014. All five of the church’s U.S. jurisdictions posted significant losses. The Northeastern Jurisdiction lost 3.8 percent, followed by the North Central and Western Jurisdictions, which each lost 3.7 percent, and the South Central and Southeastern Jurisdictions lost 3.4 and 2.4 percent respectively. From 2012 to 2016 average weekly worship attendance plunged 10.5 percent, which is equivalent to 311,075 fewer people worshipping in local UM churches on any given Sunday. 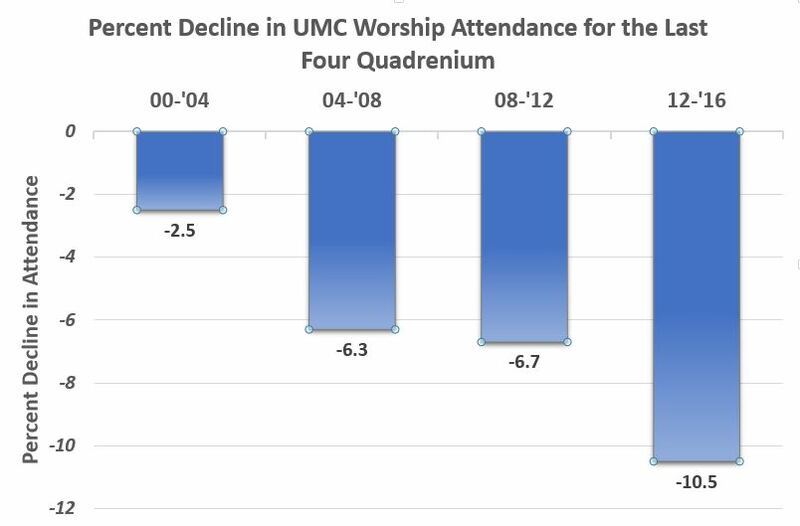 In the church’s 50 year history, no other quadrennium has come close to such a dramatic drop (2008 to 2012 was closest with a decline of 6.7 percent). The impact of such large losses radiates out from local churches and parsonages, to districts, annual conferences, and seminaries and to the denomination’s general boards and agencies. Obviously, a variety of factors fed into the unprecedented decline (e.g., a good number of local UM churches are in areas of the country where the general population is declining). We cannot help noticing, however, that the record plunge coincided with high profile and widely publicized acts of ecclesial defiance by pastors, annual conferences, and even an entire jurisdiction. And a church that was either unable or unwilling to maintain good order only compounded matters by fostering a sense of crisis and even chaos. It all eventually led to the creation of the Commission for a Way Forward and the convening of a special General Conference scheduled for February 2019. At the Wesleyan Covenant Association (WCA) we know we can and must do better. Indeed, the WCA was created to help keep the church united in these uncertain times, to champion its life giving teachings that are rooted in Scripture and the rich heritage of the church catholic, and to prepare orthodox, evangelical United Methodists for whatever is next. Therefore, the WCA is confident about the future. We are confident because we know when local churches share the Gospel in both word and deed they grow and flourish. We are confident because we believe the great proclamations of our faith still speak deeply to the hearts and minds of people who are searching for hope and meaning in this life. And we are confident because we know God is always at work in the world through the redeeming work of Jesus of Christ and the empowering presence of the Holy Spirit. So we refuse to believe the church must simply “face the facts” and glumly accept that an increasingly secular age is immune to the message of the Gospel. We refuse to believe churches, especially ones affiliated with once great denominations, can no longer reach young people and young adults. And we refuse to believe local churches cannot grow and thrive in certain cities and regions of the country. The WCA is committed to those three things, and we are confident, one way or another, we will do them. Join us!